That familiar sizzle of fat frying at street stalls.The comforting scent of cinnamon, dough, and baked apples. A snowfall of confectioners' sugar. If winter in the Netherlands could be defined by sights, sounds, and smells, these are what they would be. To recreate the taste of Dutch winter in your own kitchen, make this tried-and-tested recipe for appelflappen. It's a treat that can be described as a cross between apple pie and doughnuts—the outside is golden brown and crispy and the apple on the inside just cooked while still retaining some tender-crisp bite. Dutch apple beignets are traditionally served at New Year's Eve celebrations in the Netherlands just before all those New Year's diet resolutions kick in. So tuck in while you have a chance. In a small bowl, mix 1 teaspoon of sugar into 1/2 cup of lukewarm water. Sprinkle the yeast on top and allow to stand for 10 minutes (if the yeast doesn't bubble, discard and buy new yeast as it means the yeast is no longer active). Stir to combine and set aside. Mix together the flour and 1/4 cup/50 g sugar in a large bowl and make a well in the middle. Add the eggs as well as the yeast mixture. Warm up milk in the microwave (it should be lukewarm). Add half of the milk to the well in the flour and mix until all ingredients are combined. Add the rest of the milk and whisk until smooth. Cover the bowl with a damp dish towel and allow to rise in a warm area for about 1 hour. Once the dough has doubled, stir in the salt. The dough should be very slack and have an almost thick batter consistency. Heat the oil in a deep pan or in a deep-fat fryer to 350 F/180 C. To check whether the oil is at the right temperature, stand the handle of a wooden spoon in the oil. If little bubbles form around it, the oil is ready. Peel, core, and slice the apples into thick rounds. Using your fingers or tweezers, dip the apple slices into the dough mixture shaking off any excess batter. Gently drop each apple round into the hot oil. The fritters will sink to the bottom of the pan and then pop right back up. You should be able to fry at least 6 fritters at a time. Fry until golden brown on both sides, carefully flipping only once when required. Drain on a tray lined with paper towels. 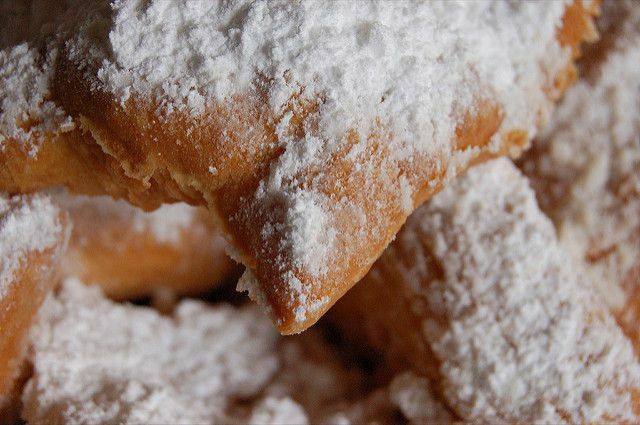 Sieve confectioners' sugar over the apple beignets along with a dusting of ground cinnamon, and serve warm. This Maraschino-Scented Dutch Dessert Tastes Perfect with Fresh Fruit. Do the Dutch Really Eat Candy Sprinkles on Bread?